Lacy produced this pioneering combination of performance, subjectivity and artistic research over a number of months in Los Angeles. 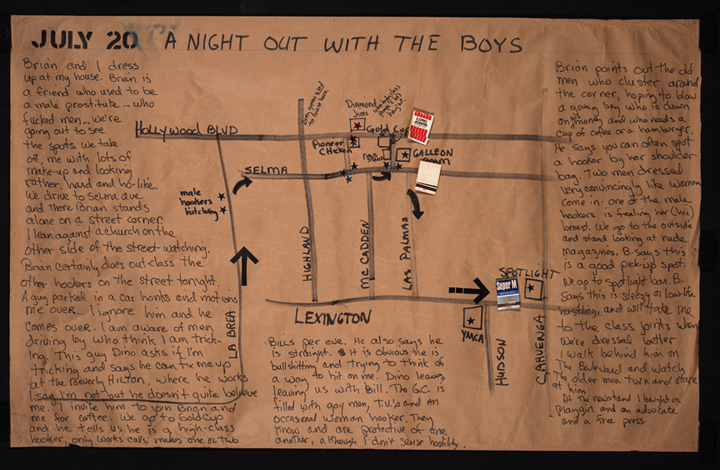 She began by drawing circles and points of connection between her friendships, acquaintances and contacts that might give her leads into a current understanding of the sites and dynamics of prostitution in Los Angeles. Going from one lead to another, she met with a variety of people over several months in their social spaces, such as bars or coffee shops, itemized what she ate during their conversations, and collected matchbook covers from restaurants to affix to a series of drawn maps that charted her physical and psychological routes through the city. 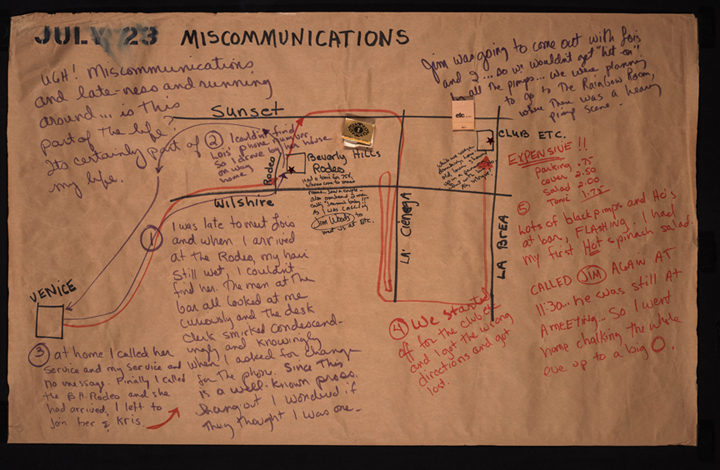 The documentation drawings included photographs and annotations of her personal revelations as she “tracked” prostitutes around California and explored the relationship between herself and the life of prostitution. In the beginning, like most people, she knew little about this world. But rather than positioning herself in performance as if she were a prostitute, something other women artists experimented with, Lacy’s subject position was as one who sought to understand connectivities between actual and imaginary experiences of prostitution. “Most of what we knew at that time came from literature and films that greatly glamorized the life. I didn’t want to flirt with their reality as a performance, or to relate their stories as an anthropologist might. Rather, I would locate the work inside my own experiences and record the process of my research. ’The Life’ as it was called wasn’t far from mine.” Through a series of drawings of maps, Lacy mapped the spatiality and psychological spaces she traversed in exploring an- other world—one that lies just below the surface, if one knows how to look—a parallel reality on street corners, in restaurants, and in the bars of Los Angeles. In 2010, Lacy reinvented Prostitution Notes as a performative reading from her original drawings with a video co-produced by Peter Kirby, presented at the Serpentine Gallery Map Marathon. The drawings were first exhibited in Social Works, an exhibition curated by Nancy Buchanan for the Los Angeles Institute of Contemporary Art, Los Angeles, California. The performance was first presented at the Serpentine Gallery Map Marathon curated by Hans Ulrich Obrist, London, England.